María Rosa de las Mercedes Casanova was born August 30, 1840 in Mosquitos in Nueva Grenada, on the Mosquito Coast of either present-day Honduras or Costa Rica. In any case, she was baptized on November 23, 1846 in the church of Nuestra Señora del Carmen in the town of Cartago in the province of Cartago in Costa Rica along with her sister, María de los Ángeles. It is not known why the two girls were baptized at the same time, but María de los Ángeles is not mentioned in any California records, nor any other record that has been found in Costa Rica; it is likely that she died in Costa Rica, shortly before the Casanova family, along with Francisco Solano, Rosa's future husband, emigrated to California. This is an image from the parish register of the church of Nuestra Señora del Carmen in the city of Cartago in Costa Rica that documents the baptisms of Rosa and her sister, Maria de los Ángeles in 1846. The following image is from a family bible that Rosa's son, Alfred, bought as a gift to his older sister, Josefina. The identity of writer is not known. 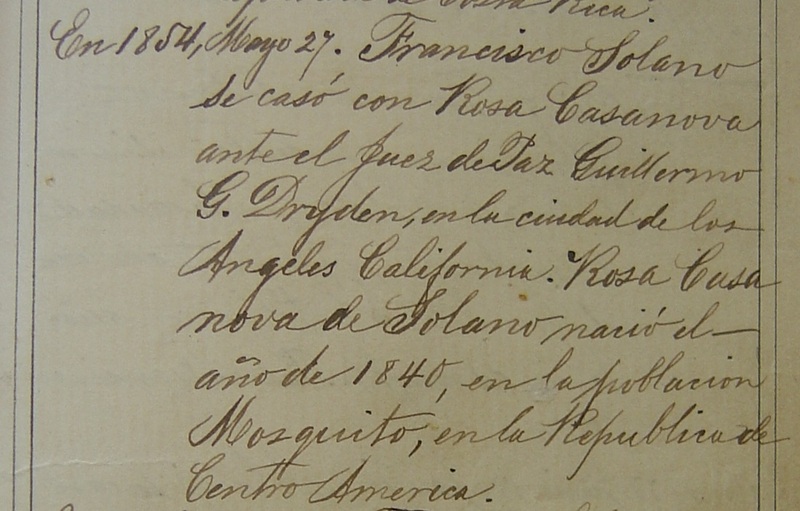 The entry documents the first marriage between Francisco Solano and Rosa Casanova in 1854. 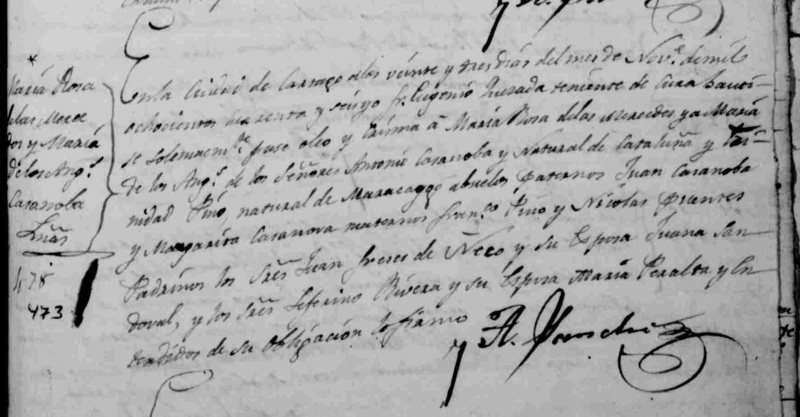 Rosa's marriage to Francisco Solano is also documented in the above image. Rosa, just 13 years and 8 months old, married 37-year old Francisco Solano in 1854 before Juez de Paz (Justice of the Peace) William G. Dryden. (The author is related to William G. Dryden by marriage.) The couple was married again in a Catholic ceremony in the Plaza Church in May, 1857, just three weeks after their son, Alfredo, was born. Francisco Solano and Rosa Casanova had a total of six children, as follows: Josefina (1855), Alfredo (1857), Alejandro C. (1859), María Agustina (one of the author's great-grandmothers, 1861), Manuel (1863), and Alonzo Francisco (1866). Just three months after the birth of Alonzo Francisco, Francisco Solano purchased 87 acres of land from the City of Los Angeles in an unnamed ravine in the Stone Quarry Hills. He immediately built an adobe on a stream that flowed from a spring that was located higher up the ravine. Francisco and Rosa moved their family to the adobe in the ravine, while Francisco maintained his butcher business and a soap factory, along with a corrall, in Sonora Town, just north of the Plaza. Rosa and her family remained in their adobe in Solano Cañon for only seven months after Francisco died. From George Hansen's diary, dated Monday, June 10, 1872. “Dª Rosa moves with her family from the Solano Cañon to her mothers house in Bath Street ..."
In 1877, Francisco Solano's widow, Rosa Casanova de Solano, married Agustín Ferlin in the Plaza Church in downtown Los Angeles. 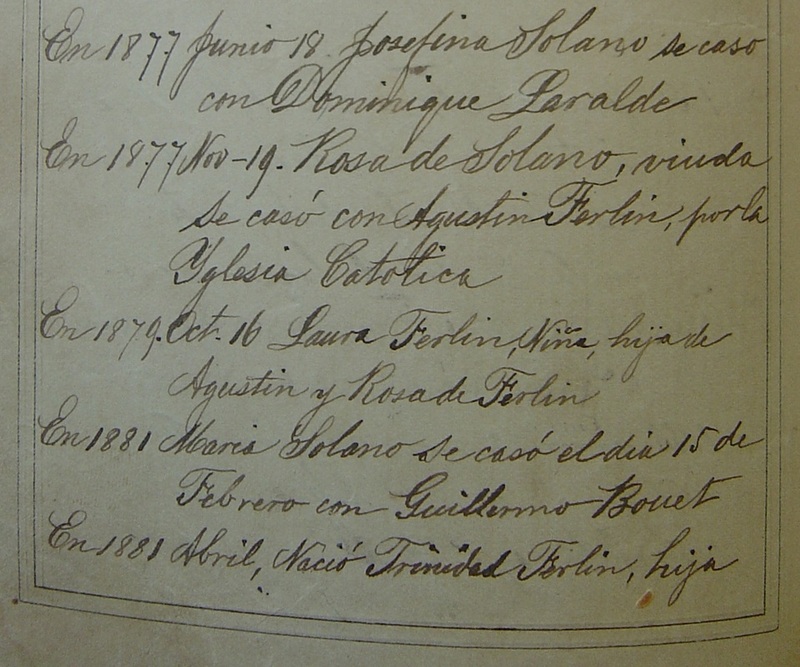 The first record on this image, from the Solano Family Bible, records the marriage of Rosa Casanova and Francisco Solano's first child, Josefina, to Dominique Larralde, who was born in le Cumberi in the French-Basque provinces. It is interesting to note that the Basque word, Iparralde, means "Northern side". The similarity between the Basque word Iparralde and the surname of Josefina's husband, Larralde, makes one wonder whether that is truly his surname or simply a descriptor of his origin in France. Next is Rosa's marriage to Agustín Ferlin in 1877. The next etnry records the birth of Laura, Rosa and Agustín's first child in 1879. Laura became the ward of Alfredo Solano, her half-brother, in 1887 and she eventually took the Solano surname as her own. The next entry records the marriage in 1881 of Rosa's other daughter, María Agustina, with Guillermo Bouett, who is from Mont-de-Marsan in Landes in the Aquitaine, about 50 miles South of Bordeaux. Landes is the French province immediately to the North of the three Basque provinces, from which Dominique Larralde came. The final entry on this page records the birth of Rosa and Agustín Ferlin's second daughter, Trinidad, in 1881. Trinidad died in Los Angeles in 1884 at the age of 3 years on the same day, August 14th, that her mother, Rosa Casanova died. Alfred notes his mother's passing in his diary. “Work all day at Rancho San Pedro survey in the evening receive word that mother died this morning at 6 am suddenly at our Tajauta farm, her husband being away in the mountains. Josefina [Larralde] has her remains taken to Los Angeles to her house. 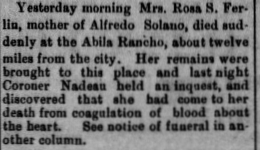 In Alfred's diary is a newspaper clipping from the following day in the Los Angeles Herald announcing his mother's death: “Yesterday Mrs. Rosa S. Ferlin, Mother of Alfred Solano dies suddenly at the Abila Rancho about 12 miles from the city." The funeral took place the next afternoon from her residence at 1017 Olive Street in Los Angeles. Her husband, Agustín Ferlin, was not present.